Cotton rompers will never go out of style. They are comfortable, convenient and inexpensive. Having sold out of virtually every set of Speed Rompers over the last few years, we thought it was only right to change things up and give new parents and fans alike, a fresh new look for one of the most popular and successful items in our entire line. The two major changes to the Speed Rompers are the addition of a bib and the packaging. We found that most of the Speed Rompers were being given as gifts so we designed a custom box with a clear top so each Speed Romper is already wrapped and ready to be given to the proud parents. Even if you are keeping them for yourself, you'll appreciate the updated packaging. 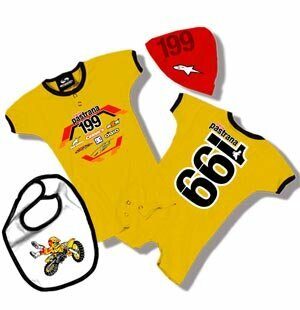 The bib has screen printed graphics and a Velcro closure, while graphics have been redesigned on the romper itself and the hats are sized accordingly.